Court Jews, called also court factors, and court or chamber agents, played a part at the courts of the Austrian emperors and the German princes in the seventeenth and eighteenth centuries and at the beginning of the nineteenth. Not always on account of their learning or their force of character did these Jews rise to positions close to the rulers: they were mostly wealthy business men, distinguished above their coreligionists by their commercial instincts and their adaptability. Court rulers looked upon them in a personal and, as a rule, selfish light; as being, on the one hand, their favorites, and, on the other, their whipping-boys. Court Jews frequently suffered through the denunciation of their envious rivals and coreligionists, and were often the objects of hatred of the people and the courtiers. They were of service to their fellow-Jews only during the periods, often short, of their influence with the rulers; and as they themselves, being hated parvenus, often came to a tragic end, their coreligionists were in consequence of their fall all the more harassed. The court Jews, as the agents of the rulers, and in times of war as the purveyors and the treasurers of the state, enjoyed special privileges. They were under the jurisdiction of the court marshal, and were not compelled to wear the Jews' badge. They were permitted to stay wherever the emperor held his court, and to live anywhere in the German empire, even in places where no other Jews were allowed. Wherever they settled they could buy houses, slaughter meat according to the Jewish ritual, and maintain a rabbi. They could sell their goods wholesale and retail, and could not be taxed or assessed higher than the Christians. The Austrian emperors kept a considerable number of court Jews. Among those of Emperor Ferdinand II. are mentioned the following: Solomon and Ber Mayer, who furnished for the wedding of the emperor and Eleonora of Mantua the cloth for four squadrons of cavalry; Joseph Pincherle of Görz; Moses and Joseph Marburger (Morpurgo) of Gradisca; Ventura Pariente of Triest; the physician Elijah Ḥalfon of Vienna; Samuel zum Drachen, Samuel zum Straussen, and Samuel zum Weissen Drachen of Frankfort-on-the-Main; and Mordecai Meisel, of Prague. A specially favored court Jew was Jacob Bassevi, the first Jew to be ennobled, with the title "von Treuenfeld." Important as court Jews were also Samuel Oppenheimer, who went from Heidelberg to Vienna, and Samson Wertheimer (Wertheimher) from Worms. Oppenheimer, who was appointed chief court factor, together with his two sons Emanuel and Wolf, and Wertheimer, who was at first associated with him, devoted their time and talents to the service of Austria and the House of Hapsburg: during the Rhenish, French, Turkish, and Spanish wars they loanedmillions of florins for provisions, munitions, etc. Wertheimer, who, by title at least, was also chief court factor to the electors of Mayence, the Palatinate, and Treves, received from the emperor a chain of honor with his miniature. Samson Wertheimer was succeeded as court factor by his son Wolf. Contemporaneous with him was Leffmann Behrends, or Liepmann Cohen, of Hanover, court factor and agent of the elector Ernst August of Hanover and of the duke Rudolf August of Brunswick. He had relations also with several other rulers and high dignitaries. Behrends' two sons, Mordecai Gumpel and Isaac, received the same titles as he, chief court factors and agents. Isaac Cohen's father-in-law, Behrend Lehman, called also Bärmann Halberstadt, was a court factor of Saxony, with the title of "Resident"; and his son Lehman Behrend was called to Dresden as court factor by King Augustus the Strong. Moses Bonaventura of Prague was also court Jew of Saxony in 1679. The Models were court Jews of the margraves of Ansbach about the middle of the seventeenth century. Especially influential was Marx Model, who had the largest business in the whole principality and extensively supplied the court and the army. He fell into disgrace through the intrigues of the court Jew Elkan Fränkel, member of a family that had been driven from Vienna. Fränkel, a circumspect, energetic, and proud man, possessed the confidence of the margrave to such a degree that his advice was sought in the most important affairs of the state. Denounced by a certain Isaiah Fränkel, however, who desired to be baptized, an accusation was brought against Elkan Fränkel; and the latter was pilloried, scourged, and sent to the W¨lzburg for life imprisonment Nov. 2, 1712. He died there 1720. David Rost, Gabriel Fränkel, and, in 1730, Isaac Nathan (Ischerlein) were court Jews together with Elkan Fränkel; Ischerlein, through the intrigues of the Fränkels, suffered the same fate as Elkan Fränkel. Nevertheless, Nathan's son-in-law, Dessauer, became court Jew. Other court Jews of the princes of Ansbach were Michael Simon and Löw Israel (1743), Meyer Berlin, and Amson Solomon Seligmann (1763). The great elector also kept his court Jew at Berlin, Israel Aaron (1670), who by his influence tried to prevent the influx of foreign Jews into the Prussian capital. Other court Jews of the elector were Gumpertz (died 1672), Berend Wulff (1675), and Solomon Fränkel (1678). More influential than any of these was Jost Liebmann. Through his marriage with the widow of the above-named Israel Aaron, he succeeded to the latter's position, and was highly esteemed by the elector. He had continual quarrels with the court Jew of the crown prince, Markus Magnus. After his death his influential position fell to his widow, the well-known Liebmannin, who was so well received by Frederick III. (from 1701 King Frederick I. of Prussia) that she could go unannounced into his cabinet. There were court Jews at all the petty German courts; e.g., Zacharias Seligmann (1694) in the service of the Prince of Hesse-Homburg, and others in the service of the dukes of Mecklenburg. Others mentioned toward the end of the seventeenth century are: Bendix and Ruben Goldschmidt of Homburg; Michael Hinrichsen of Glückstadt, who soon associated himself with Moses Israel Fürst, and whose son, Reuben Hinrichsen, in 1750 had a fixed salary as court agent. About this time the court agent Wolf lived at the court of Frederick III. of Mecklenburg-Strelitz. Disputes with the court Jews often led to protracted lawsuits. 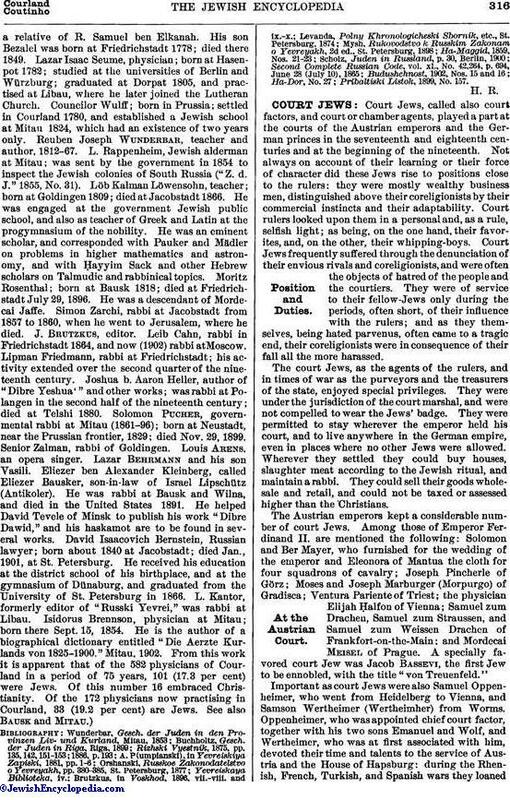 The last actual court Jews were Israel Jacobson, court agent of Brunswick, and Wolf Breidenbach, factor to the Elector of Hesse, both of whom occupy honorable positions in the history of the Jews. 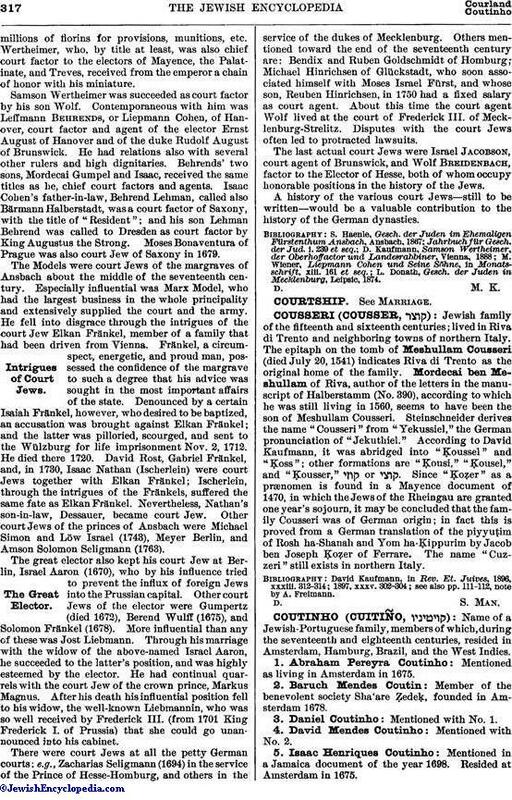 A history of the various court Jews—still to be written—would be a valuable contribution to the history of the German dynasties. L. Donath, Gesch. der Juden in Mecklenburg, Leipsic, 1874.